The Roman Catholic Diocese of Providence on Sunday hosted the National Organization for Marriage’s rally for antigay heterosexual Christian couples. The Providence Journal covered the event. Antigay couples in attendance listened to Christian music, attended a worship service, and “renewed vows” against gay couples and their children. “I came because I love God. I love my family. 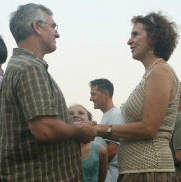 And I love my wife,” said Thomsen, a Warren native who now lives in Mansfield, Mass., with his wife of 21 years, Lori. Some gay couples who attended opted not to bring their children, for fear of the children’s safety. Such selfishness, elitism, and ostracism of children by antigay couples, NOM, and the Catholic church should sadden anyone who is concerned about the decline of Christian values among avowed social conservatives. Children of gay couples deserve to have two married parents — but the National Organization “for” Marriage, the Roman Catholic Church, and their supporters vowed Sunday that the children of gay couples shall be treated as second-class citizens. Earlier, the NOM expressed feigned outrage that consumers who favor tolerance would raise their voices in protest after it was disclosed that NOM had tricked two sponsors into donating foods to an antigay political and religious event, in violation of corporate guidelines against sponsorship of such events. NOM’s unmistakable message: Antigay consumers should enjoy special rights and sponsorships at the expense of tolerant consumers — and tolerant consumers should shut up and tolerate intolerance, deception, and violation of corporate policies. If NOM were to successfully ban people from shopping wisely because other shoppers might lose special perks, then gay people would be compelled to silently buy products from bullies, Jews would silently buy products from anti-Semites, Christians would silently buy products from atheists, pro-lifers would silently buy products from abortion providers, and so on. NOM’s hypocrisy and anti-Christian conduct are stunning.